On Monday 13th June 2016, award-winning Scotch whisky brand, R&B Distillers, commenced their momentous endeavour – to build the first legal distillery on the Isle of Raasay. With construction now underway, R&B plan to open, and begin production, in April 2017. R&B stands for Raasay and Borders, two unique landscapes brought together through one unique whisky company. Cofounder Alasdair Day embodies this coupling. His great grandfather, Allan MacDonald, hailed from the Hebrides while his other great grandfather, Richard Day was a master-blender in the Borders in the early 19th Century. It is this history that has prompted R&B’s ongoing project to build distilleries at these twin roots. The former, on Raasay, is steadily becoming a reality. In February 2016, R&B Distillers received permission from the Highland Council to bring the first legal distillery to the remote Isle of Raasay, an island where illicit distilling was once rife. The island’s striking Victorian villa and ex-hotel, Borodale House, has stood empty since 2006, and will now be converted into a visitors centre and luxury members’ accommodation with adjacent distillery. Designed by Olli Blair from ABIR Architects and Allen Associates, the distillery will be independently owned and operated and is expected to generate employment for up to 10% of the island’s 120 residents. Having subsequently secured grants for the distillery build from the FPMC (Food Processing Marketing and Co-Operation Grants Scheme), and the Highlands and Islands Enterprise, for the development of a visitor’s centre, construction for this long-anticipated project can at last commence. Patience is imperative to the whisky business but R&B are satisfying their notorious impatience with Raasay style whisky already on the shelves. In December 2015, R&B Distillers released the aptly named, Raasay While We Wait whisky, a lightly peated single malt offering a handcrafted tantalising impression of the calibre and flavour of whisky yet to come from their Isle of Raasay Distillery. The distillery on Raasay will be furnished with two copper pot stills from Frilli in Tuscany, thus R&B decided to finish While We Wait in Tuscan red wine casks, endowing the whisky with its distinctive soft heather hue. Its profile signifies the care and attention the company will take to handcraft uncommon Scotch whisky with quality ingredients and a local water supply filtered through volcanic rock, on an island boasting some of Scotland’s most unique geology. In May 2016, it was awarded its first international award, a bronze medal in the International Spirits Challenge (ISC), a tremendous accolade for such a young whisky and an exciting taster of things to come. With the distillery set to open and begin production in April 2017, the first single malt from Raasay will be bottled in 2020. R&B Distillers predict that they will produce 150,000 bottles of Scotch whisky a year. 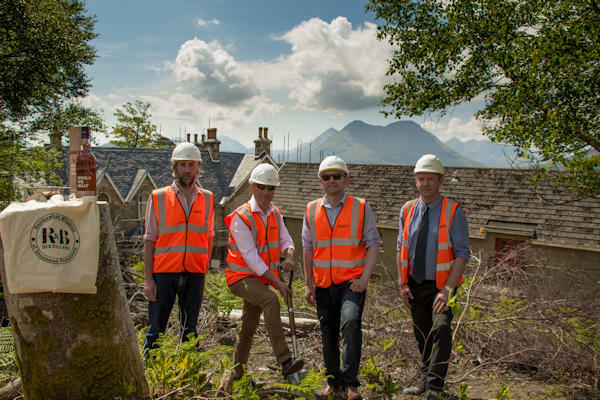 Borodale House will be transformed into the Isle of Raasay Distillery visitor centre which is projected to bring in 12,000 visitors to the island in the first year. Nestled below the magnificent Dùn Caan and with some of the best views of the Isle of Skye; uninterrupted sight of the Cuillin mountain range, Borodale House will offer an atmospheric escape for R&B Distillers’ Na Tùsairean Club members. Na Tùsairean is Scot Gaelic for ‘The Pioneers’, members are invited to join R&B Distillers on their whisky journey and watch the distilling process unfold. Members will own whisky from the first 100 casks distilled, and be able to enjoy the luxury members’ lounge and five members’ ensuite rooms – three with views towards Skye and two looking onto the distillery itself. Environmental concerns are always paramount when undergoing a construction project of this scale thus in 2015 R&B Distillers carried out a host of wildlife surveys to ensure they were accommodating the islands diverse wildlife. This revealed that the UK’s most North-Westerly population of Brown Long Eared bats, were nesting in the roof. R&B have now accommodated this colony in a new ‘Bat Hotel’ in the roof and bat boxes up in the trees to protect these precious creatures during, and after, the build. Of this exciting news, co-founder Alasdair Day comments “it has taken an enormous amount of effort and endeavour to get to this point and we are all aware of what we still have to achieve, however we are delighted that work has commenced on site. We are all full of excitement and anticipation for the future as we aim to be Scotland’s leading craft distiller”.